The lovely Astrid has chosen 'shabby chic' as the theme for this months challenge at Country View Crafts and I have created a canvas as my second DT project for the month. These are the same process steps as I used on my summer canvas for the Pickwell Farm workshop. 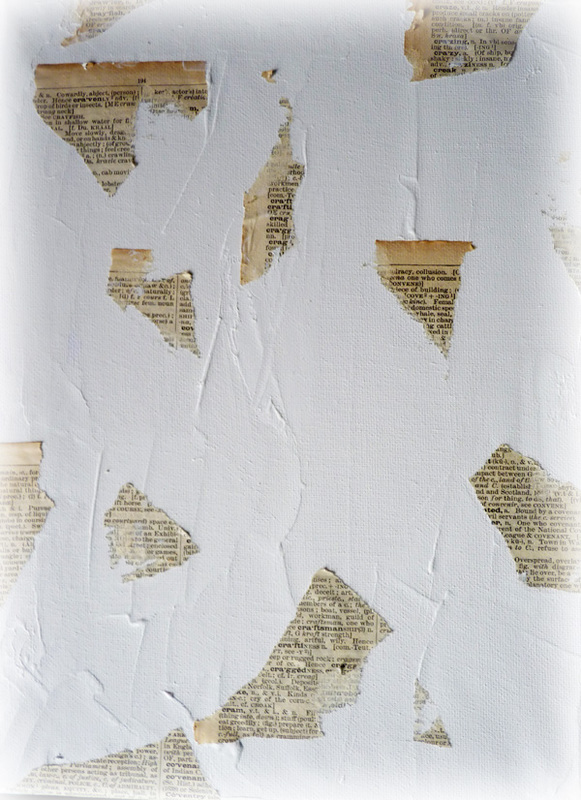 Apply gesso with a palette knife and press some torn dictionary paper into it whilst it is still wet and heat dry. Adhere some die-cuts to add both contrast and texture to the background. Again heat dry. 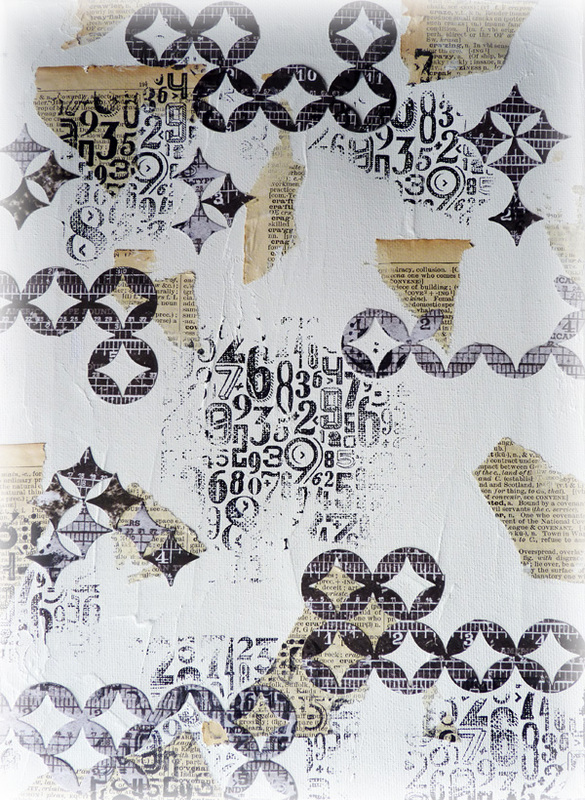 Stamp numbers randomly using black archival ink. Use chosen distress paints and smear colours one at a time randomly on the canvas using a babywipe rub them in gently. Heat dry between each colour. I used frayed burlap, pumice stone and antique linen. Using gesso, a piece of cut and dry foam and a stencil, add texture onto the canvas (woops sorry missed the photo for this stage). 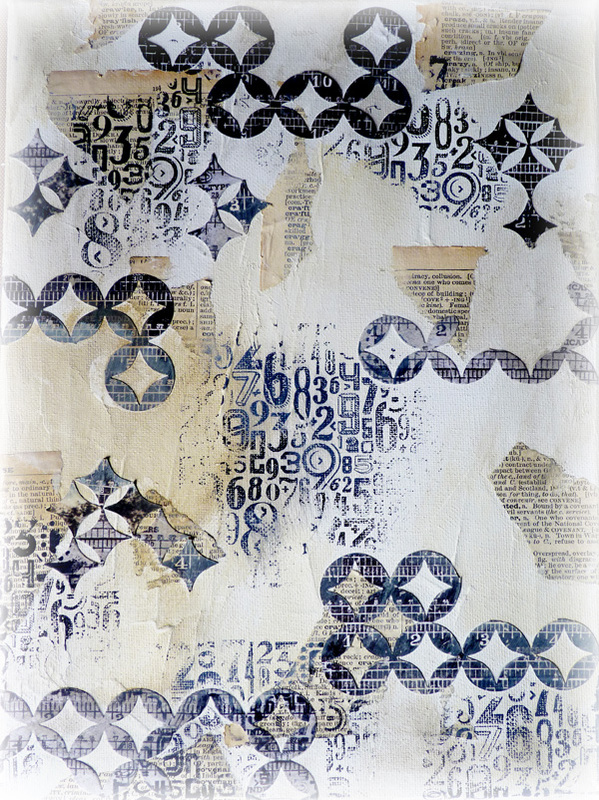 Then using texture paste, a different stencil and a palette knife add further texture randomly over the background - I used the Tim Holtz flourish. 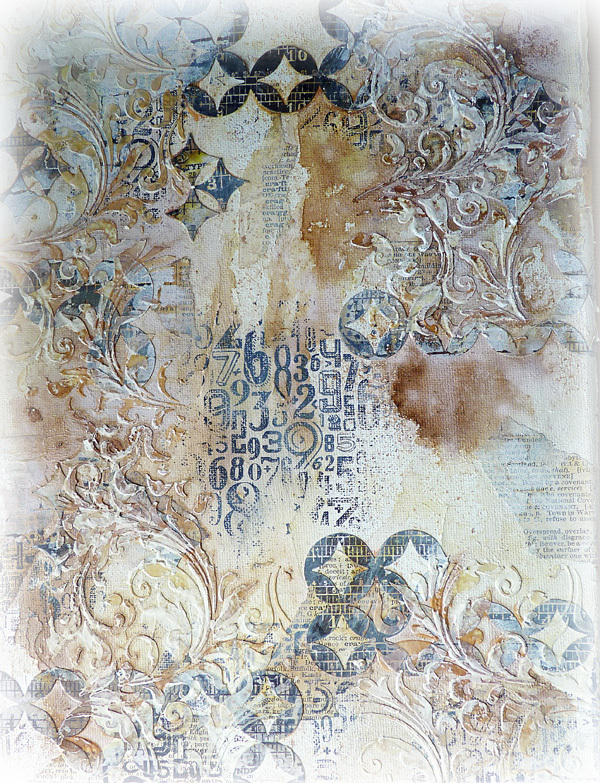 Daub some stains onto the background and spritz them with water, let the colours drip around the textured areas. It doesn't matter if your colours are getting a bit too dark or intense at this point. Heat dry. 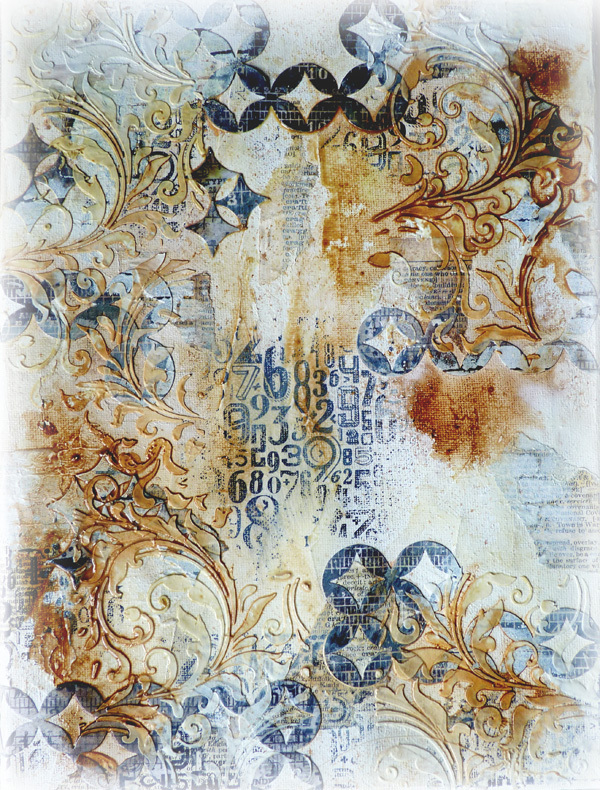 Daub small amounts of your chosen colours in distress inks on the craft mat, spritz with water and dip the edges in them to provide continuity of colour around the whole canvas. With a small piece of credit card drag a thin layer of light modelling paste over the raised areas and quickly dry. Then drag white gesso over the same areas and again dry them off quickly. (The gesso absorbs the water based colours underneath and needs a white base to stay whiter). Daub some picket fence distress paint on the heat mat, spritz it with water and dip the canvas in it quickly drying it - repeat if required. Drip some spots of paint in random areas. At this point I didn't want to cover up the background I like the texture and colours so much. 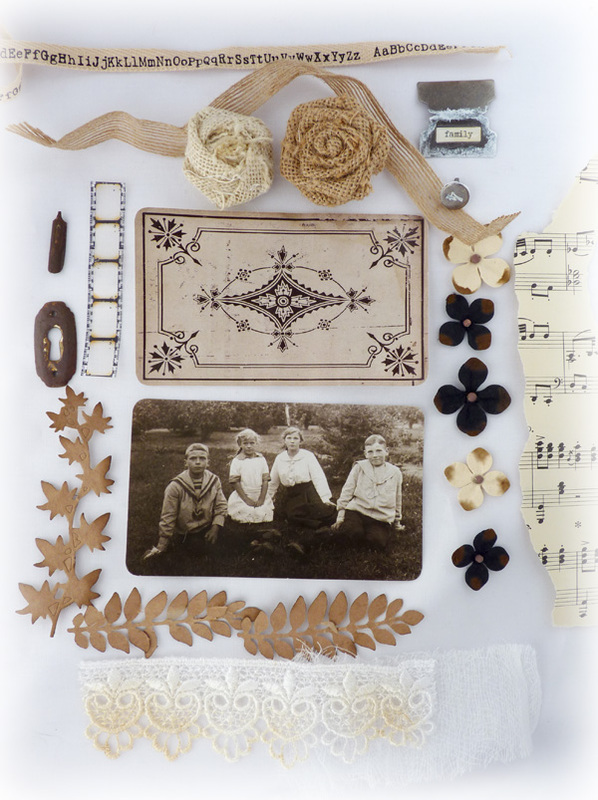 I gathered some elements together that I thought would look good for a shabby vintage collage and I never know if I am going to end up using all the pieces or not. I ended up using the Tim Holtz film strip and leaves which were painted with some gesso and picket fence distress stain mixed. The hessian flower was one I bought on my recent trip to California. .... as was the lock and the beautiful lace was given a very light spritz of antique linen distress spray. 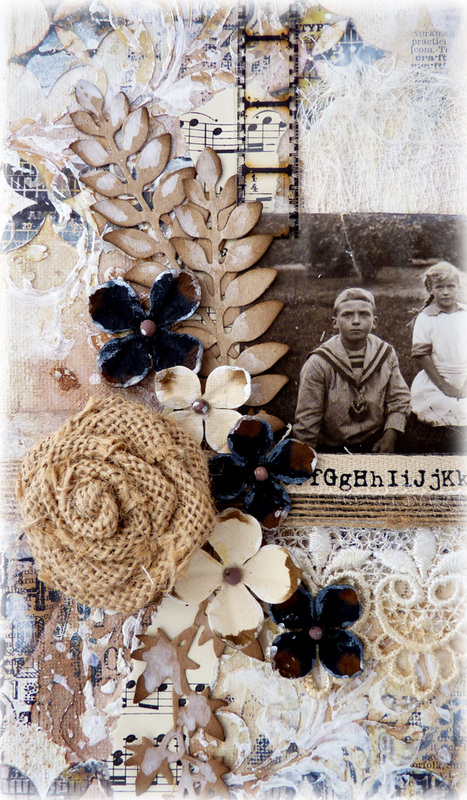 I love the contrast of the collage elements over the textured background. It's not often I use the shabby style these days, but I thoroughly enjoyed creating this canvas. Thanks for stopping by, I hope we will see you over at the Country View Challenge where there is a £20 voucher to the Country View web shop for the lucky winner. STUNNING Brenda..I so loved the tutorial and the end result is magic..I'm a newbie at canvases and made a right disaster the other day with a reaction to something I used and the pastels look all dirty now..but I love this...gorgeous. A great tutoria and will help many who want to try out mixed media. 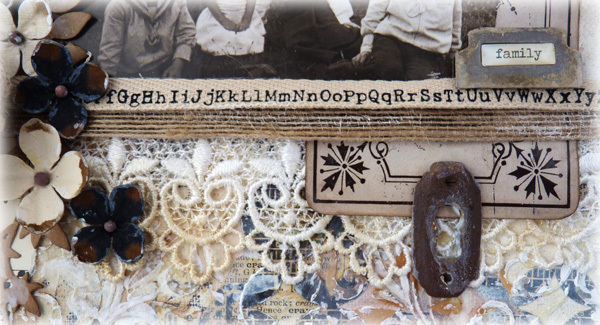 This is a wonderful example of Shabby meets Mixed media. a beautiful canvas Brenda and I love the wonderful details you have shared. The background looks amazing and I understand why you don't want to cover it !! The layout is beautiful and there is so much to look at. Love that hessian flower........ !!! 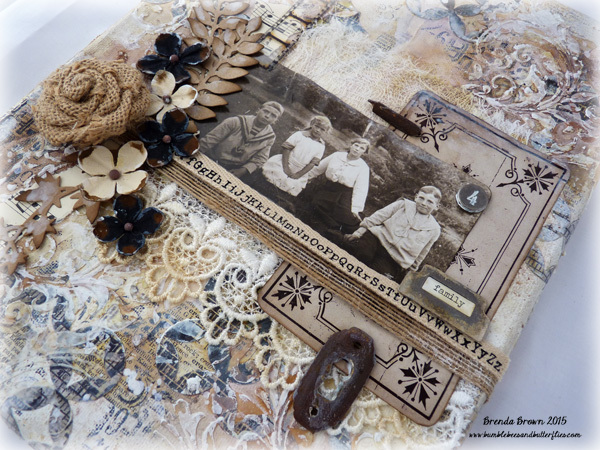 Wonderful post, tutorial and canvas Brenda! Love It! So many lovely layers of texture and interest. Beautiful canvas! I love that piece of alphabet running right along the bottom of the photo. Such Great work on textures for this background ! Thanks for sharing the process! Gorgeous! LOVE that yummy background and all the texture!!! This is gorgeous Brenda. The texture is amazing, so many layers! 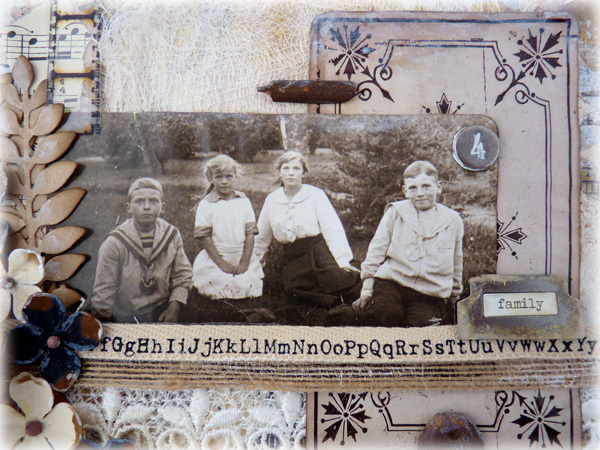 Brenda this is gorgeous and your tut is so easy to follow thank you for that... definitely want to try this and have some of my own family photos that would be great on these. 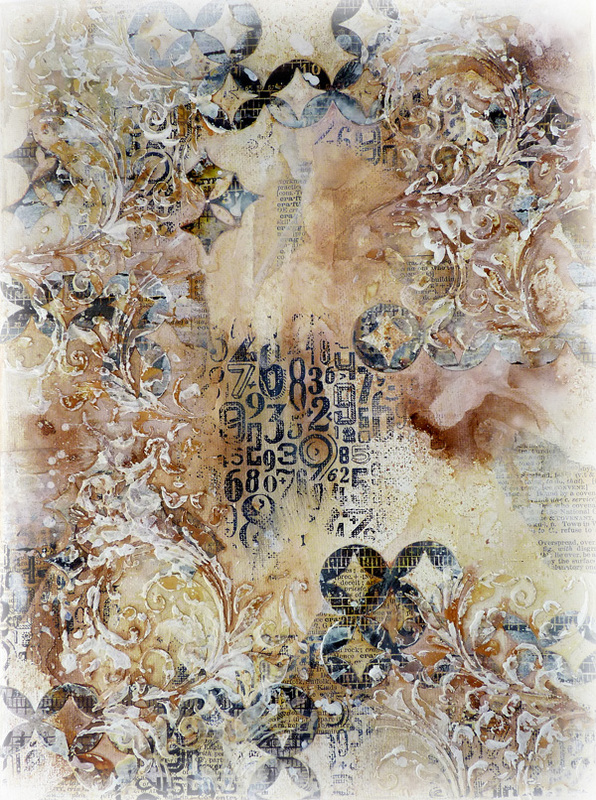 A gorgeous canvas, I enjoyed reading how you created this piece, the textures look fantastic. This canvas is so beautiful, Brenda! I really love the texture of the background. Perfection! Thank you so much for sharing such an interesting and lovely creation. There are so many techniques and i have had fun following along, though mine is a pale imitation! What i would like to know are which colours you used apart from frayed burlap, pumice and antique linen. Again, thank you for sharing and helping me. 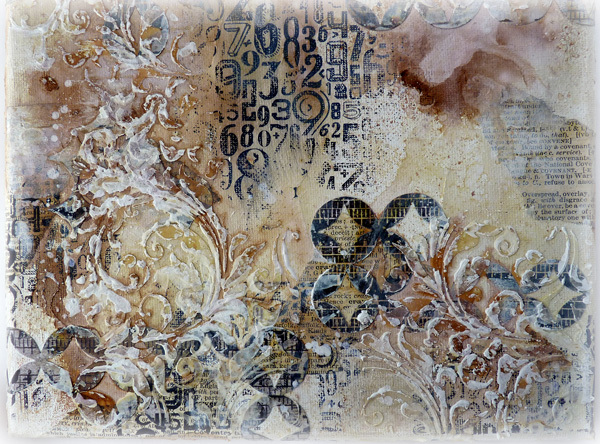 Brenda, this canvas took my breath away over at Country view challenges, and now that I see it up close, I am ever that much more in love with all the texture and shabby-grunge collage composition. 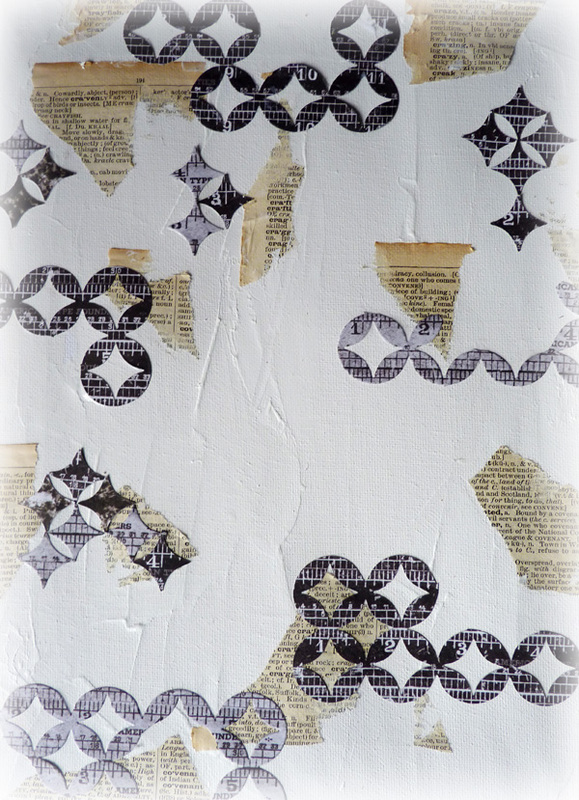 Your background truly looks like chipped away layers of old stucco'd and peeled wallpaper'd walls. Just love the bit about adding back texture paste and gesso before dipping into Picket Fence DP. I will certainly give this background a go, but I'm afraid if I did the collage it would just look like a huge mess! Well done, again! Love it! Hugs! Completely fabulous Brenda!! I can see why you had a hard time covering up the background, it is stunning! But all I can say is that the collage elements have enhanced it even further! It looks fantastic and perfect for the challenge theme! LOVE this big time!! 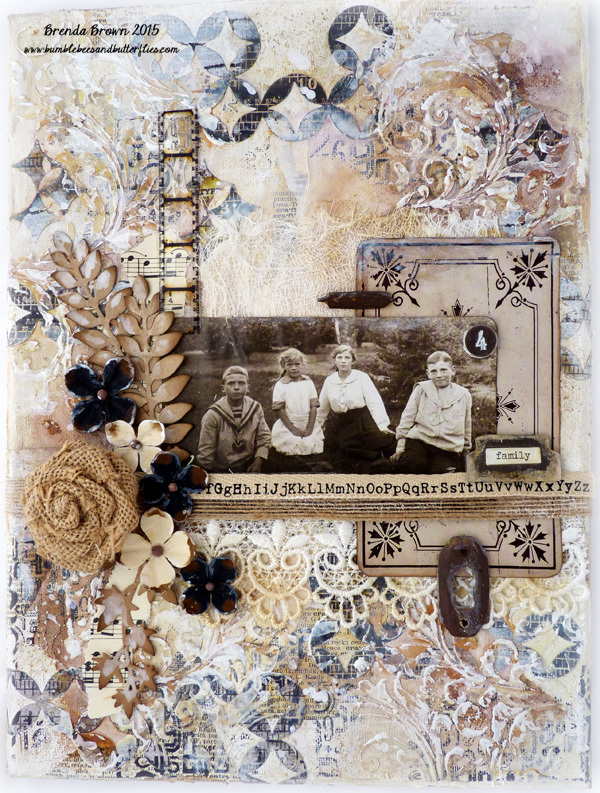 a great project, love al those layers and the neutrals are just a joy! sorry I am so behind commenting! Your Canvas is totally gorgeous Brenda. I love the vintage Look and all the textures on your creation. Great job. Amazing! Love the texture, the lace, the soft shades, everything is perfectly matched! Brenda, that is stunning! Amazing layers and textures and thank you so much for sharing your detailed step by step tutorial, I learn so much from you. 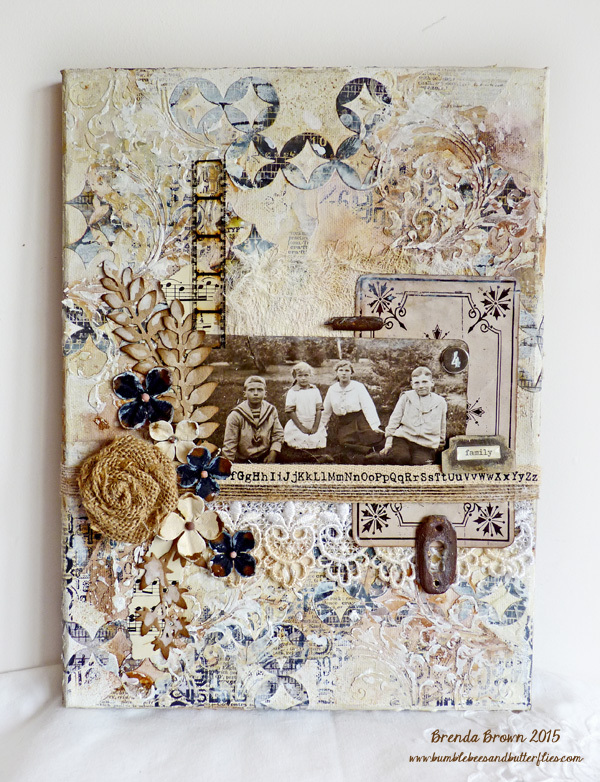 Amazing journal page that is perfectly shabby and chic, love it! A stunning canvas Brenda, thanks for sharing the process. Hi Brenda - I did give it a go !! !